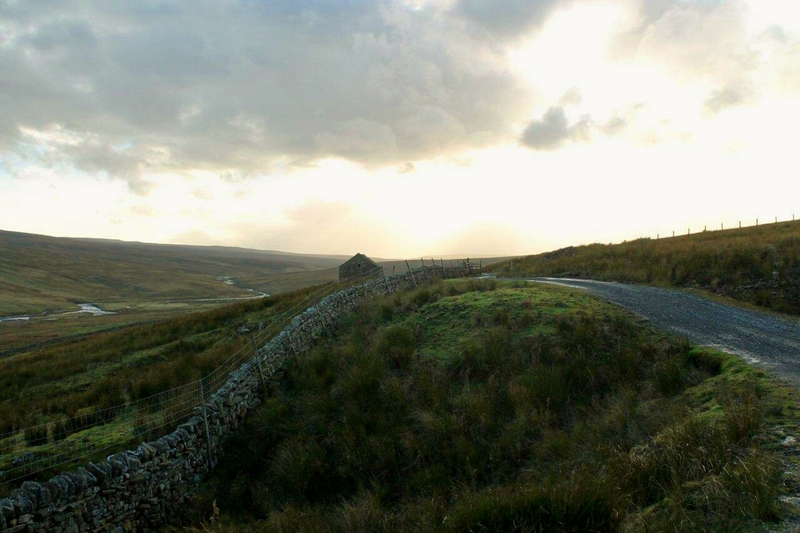 THE weather girl said an arm of rain would sweep across the country and disappear from the North-East at about midday, leaving the Pennines saturated beneath patchy cloud and intermittent sunshine. I’m thinking about this “arm of rain” as I slosh around Cow Green reservoir and over the dam, because I’ve never seen an arm of rain before. I’m also questioning my rather flippant and automatic use of the term “weather girl” to describe a professional and probably highly-qualified meteorologist, when I would never dream of referring to her male equivalent as a “weather boy” . . . This is the sort of stuff that fills your head when you walk alone. I should be dwelling, really, on what I’m going to write about High Cup – my destination – and the geological forces that gouged this uniquely spectacular valley out of the Pennines and left it girdled with crags that resemble the interlocking basalt columns of the Giant’s Causeway. That’s what I should be thinking about. But as the rain ceases and a fresh wind lifts the clouds above the Teesdale heather, something hugely more interesting arrests my attention. 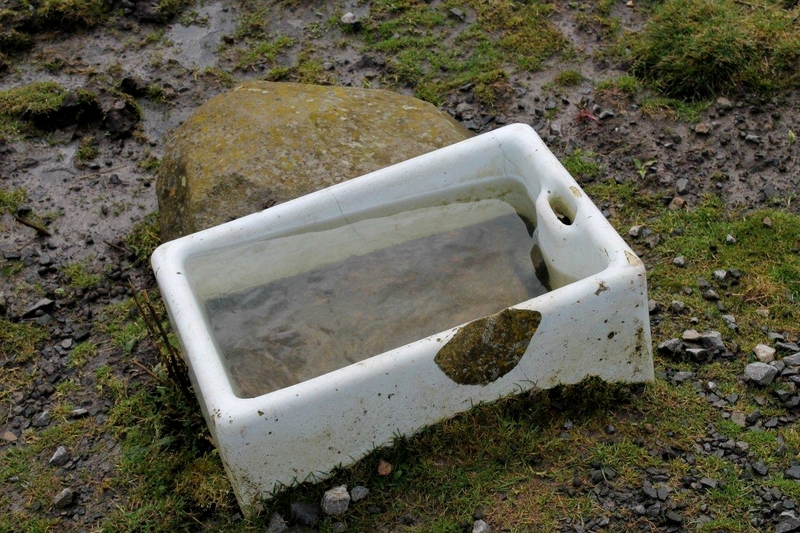 At the side of the track to Birkdale Farm is a Belfast sink, placed there in the days when livestock sought supplementary refreshment. I utter an exclamation of joy. The weather girl and her arm of rain are immediately forgotten. Because the Belfast sink marks a turning point in the development of mankind. The Belfast sink was our zenith. When people ripped them out of their kitchens in the 1960s and 1970s, evolution ebbed away like a low tide from a mudflat. Let me tell you about Belfast sinks and the anomaly that Darwin missed because he died too soon. 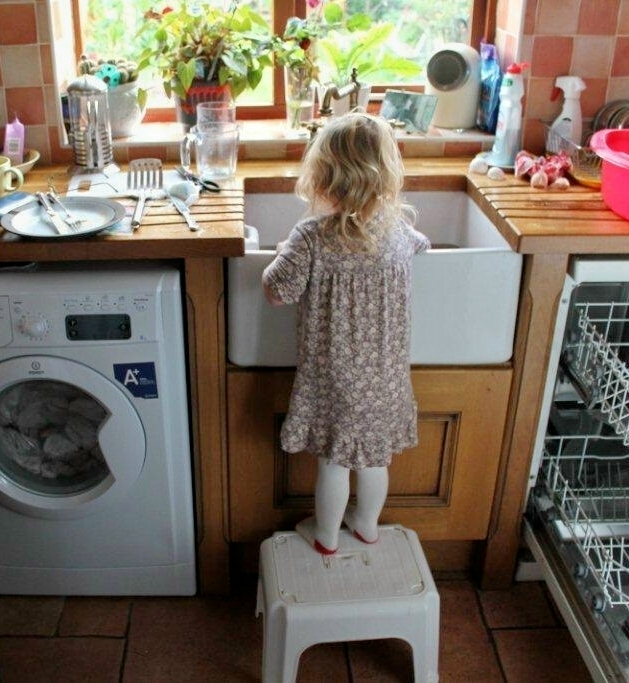 Eight years ago we had a Belfast sink installed in the kitchen because it seemed like a good idea. And it was. You can’t imagine what you can do in a Belfast sink. Want to wash a bucket of potatoes, a garden spade and an unruly grand-daughter? Chuck them in the Belfast sink at the same time. Worktops clogged up with all those pots and pans after the Sunday roast? Chuck them in the Belfast sink. Twenty stained wine bottles to wash out for the home-brew? No bother, soak them in the Belfast sink. Tread the grapes in there as well if you like. Hey. I remember being bathed in a Belfast sink by my mother. You had to stand up to get your legs scrubbed. I had two old aunties and an uncle who lived in a house in Walker Street, Askam-in-Furness, and their Belfast sink was the only indication that a sanitary system existed – except for the loo at the bottom of the yard. There was a zinc bath hanging from a nail in the wash-house, but it was never used because all functions were performed at the sink. And that was the way of the world. We arrived at that point of human development with a perfectly acceptable, fully functioning, completely practical, utterly simple and thoroughly hygienic item of kitchen equipment that fulfilled our requirements. But along came consumerism, DIY (the modern curse of the working classes) and Barry Bucknell, the man who showed the nation how to modernise their homes by covering architectural features (banisters, panelled doors, pianos) with hardboard and removing everything that’s useful. Belfast sinks were ripped out and smashed. An entire nation’s housing stock was refitted with sinks that were just big enough to hold a plastic washing up bowl. What’s the point of that? If your bloody sink’s the size of a washing up bowl, why do you need a washing up bowl? Where’s the logic? Don’t tell me I’m alone on this. And then. And then they sold us the sink unit that had a little oval baby sink at the side of the main sink – but the cumulative volume was still not as great as the Belfast sink. And to this day I still don’t know what the little oval baby sink is used for. Is it for cleaning billy cans after a weekend in the hills when your wife’s filled the main sink with ladies’ things? Or dipping your innertube in to find a puncture when your bike chain is soaking in degreaser in the washing up bowl? Does anybody out there know the purpose of the little oval baby sinks? Any weather girls reading this? So here at the side of the track to what is reputedly England’s highest farm is the pinnacle of mankind’s domestic advancement, now brimming with rainwater and looking a bit sorry for itself. In more ways than one this sink is the equivalent of Donald Campbell’s Bluebird, or the ill-fated Blue Streak rocket a few miles to the north at RAF Spadeadam. It represents British achievements that were left by the wayside instead of being held aloft and borne into the future. Belfast sinks are up there with the bouncing bomb, Marmite, ring-pull beer cans, the internet, Rolls-Royce cars and the invention of silage. Belfast sinks R us. Jesus Christ. 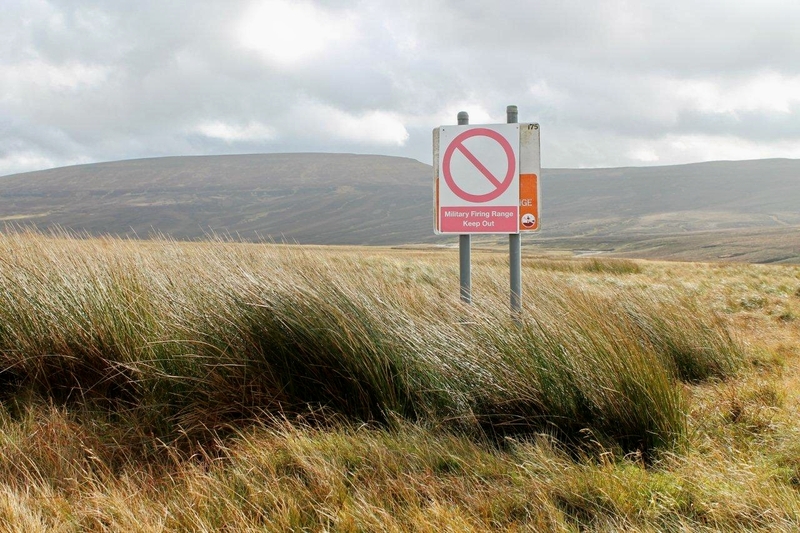 I plod on across the moor fuming. That Bloody Barry Bucknell. He’s got a lot to answer for. 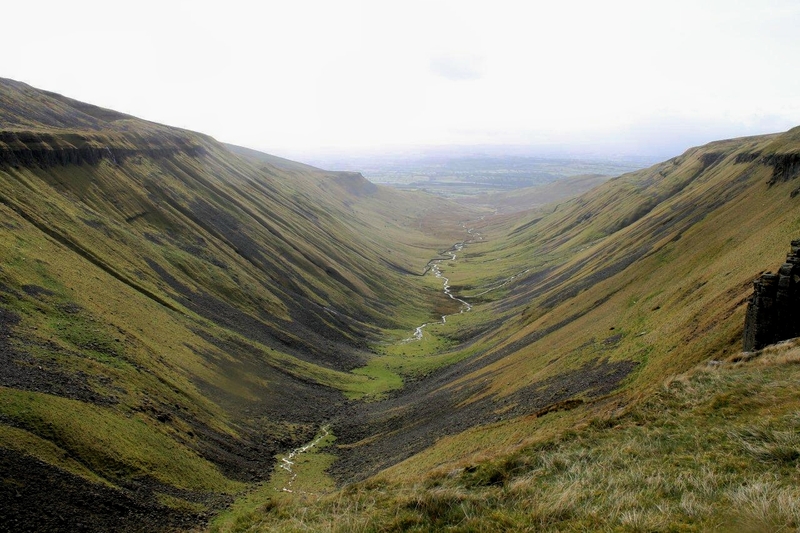 The track from Birkdale Farm to High Cup, which forms part of the Pennine Way, passes through the spoil-heaps of an old mine called Moss Shop. 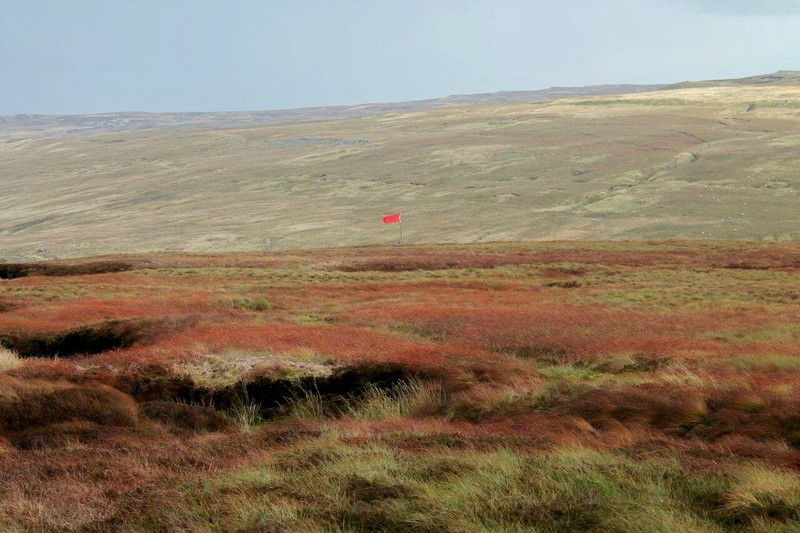 Red flags are flying on the moor away to the south. Occasionally I hear bursts of heavy machine-guns. That’s the Army training youngsters to fight the Taliban so we can sit safely in front of our flat-screen televisions and dream up new ways to improve our homes. Don’t get me started on uPVC doors and windows for Christ’s sake. That rant about sinks has worn me out. 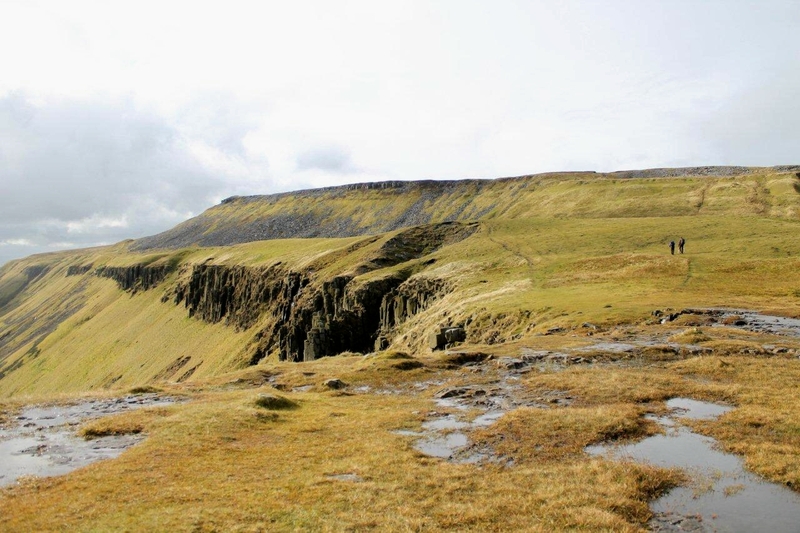 As I reach High Cup Nick a terrific gust of wind whips the bandana off my head and skims it over the edge. Bugger. I lost one in Spain. I’m not sacrificing another to the sodding Pennines. So I pick my way down through the crags, retrieve the bandana, pick my way up again, and munch my sandwiches while watching a waterfall being blown into the air and back over the crag from whence it sprang. That’s pretty impressive. The wind drops and the sun comes out to allow me to take loads of pictures, which cheers me up a bit. The weather girl got it right after all. The arm of rain has passed like a royal wave in a Pathé newsreel. 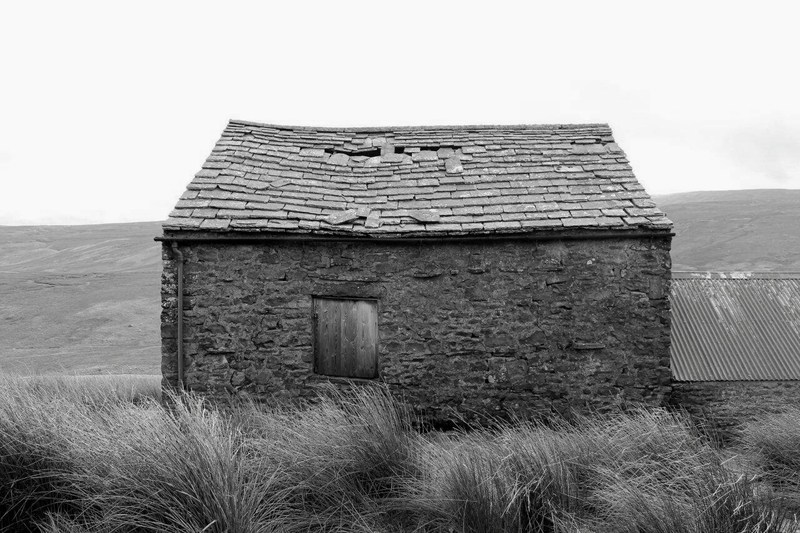 Then all that remains is a long plod back to Cow Green reservoir across six miles of sloshing peaty moors and rough muddy tracks. Might have to dip the boots in the Belfast sink when I get home. Can’t remember if I took those muddy bike wheels out before I left the house this morning. Hope the wife doesn’t get home first. I can’t find much on the geology of High Cup, but this short account is probably all that’s needed. According to his entry on Wikipedia, besides being Britain’s first DIY television presenter Barry Bucknell was a Labour councillor on St Pancras council. His greatest achievement, though, was the reinvention of New Labour from a prototype knocked up out of plywood and panel pins at the behest of Tony Blair. Sorry, I made that up. AND FINALLY, I’LL LEAVE YOU WITH THIS . . . 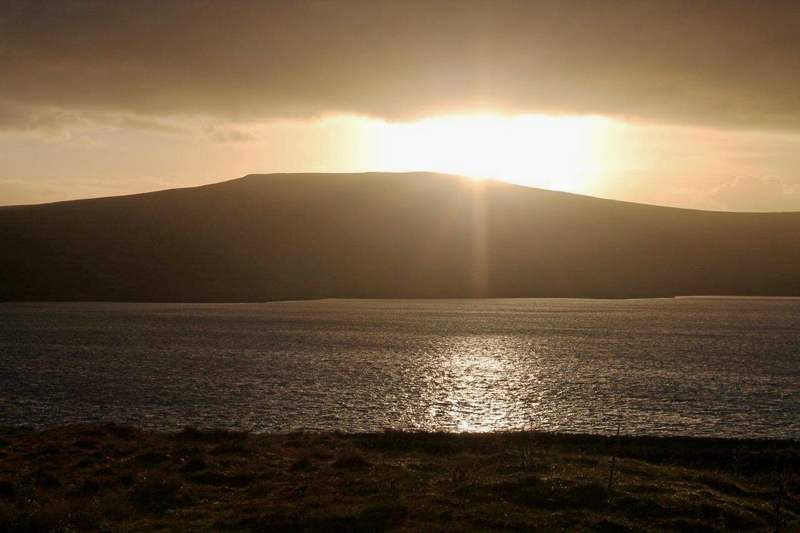 This entry was posted in Barry Bucknell, Belfast sinks, Charles Darwin, Climbing, Environment, Geology, Hiking, History, Industrial archaeology, Life, Mountains, Ranting, Walking and tagged Mining History, outdoors, Pennines. Bookmark the permalink. That was most enjoyably rantingly funny! I remember Belfast sinks too and having to stand up! Hi Alistair. It never did me any harm, and I bet it didn’t do you any either. I think we’ve both turned out to be reasonable, level-headed blokes. I`ve known Alistair for over 20 years.Reasonable ? Level-headed ? I recall something he once wrote about dropping his toast butter-side down one breakfast when he obviously got out of bed the wrong side. That was very reasonable and level-headed. Beautiful musings as usual, My parents have a picture of me, my brother & my best friend not knee high awaiting turns for the Belfast Sink my dad excavated from an old terrace we then used as a paddling pool during the 70’s summer months. I was sat here still pondering the memory until I came upon the images of High Cup Nick, they leave me inspired & are truly magnificent. Your right about weather girls though, beneath the glam they are meteorologist & we should respect that, right? , I blame the yanks – but there still easy on the eye. Hiya Paul. You’ve opened my eyes to new uses for Belfast sinks – as leisure amenities. The nation’s children could have endless hours of fun mucking around in them in the middle of the garden. All the more reason to bring them back. You couldn’t do that in an old stainless steel sink unit. 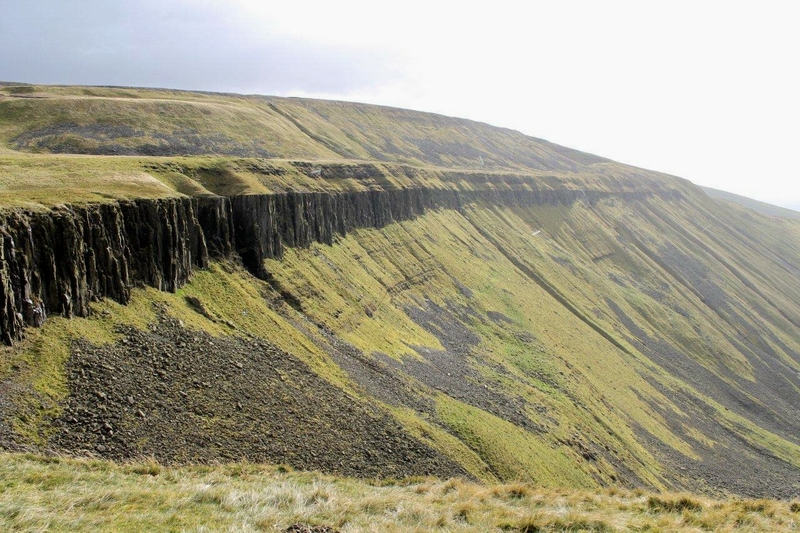 High Cup Nick is pretty spectacular. Don’t know if you’ve been there but it’s a short walk from the Cumbrian side, but more spectacular if you plod across from Teesdale. I’m not saying any more about weather girls. The subject has already caused a lengthy discussion in the household. Ah, Mrs Potter. I’ve consulted a knowledgeable person on your theory and she agrees that the teeny-weeny sinks are for draining things, and for now I will go along with this but I am not a hundred per cent convinced. I do, though, agree that you can quite conveniently bathe children in ordinary sinks. I have a picture of my son in an ordinary sink, and I would post it here as proof but for the fact he would retaliate by posting an embarrassing picture of me on his Facebook site. So that’s out. As for teapots, there was a time when the backyard drain was good enough for tipping them down. Ah, the good old days . . .
Only you would manage to get a lot stuff on Belfast sinks into a walking blog 🙂 That’s why I find your blog so absorbing. 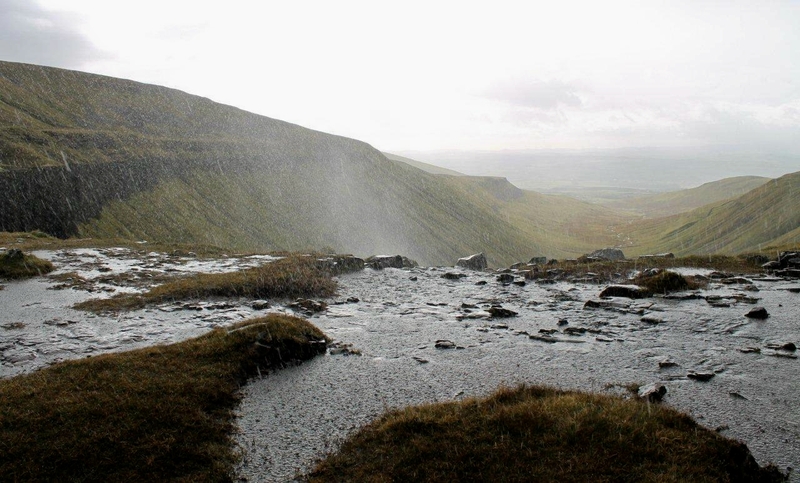 I have never been to High Cup, but have walked around the area. I will get around to it at same stage as I am around the half way point on my long term goal of walking the Pennine Way in stages in between walking lots other bits of the UK. The next few stages will cover this. Hi Mark. 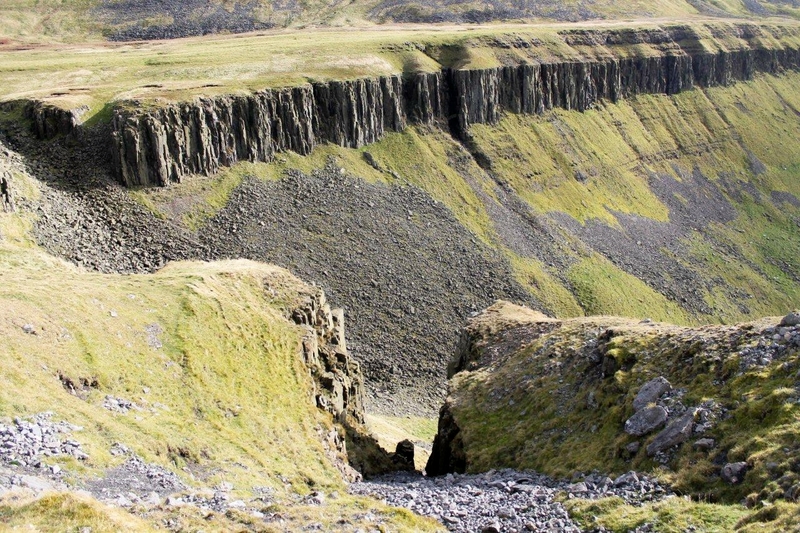 In one of the photographs you can see two people walking around the northern rim of High Cup. They were an American couple walking the Penning Way and they were very much impressed with the landscape. 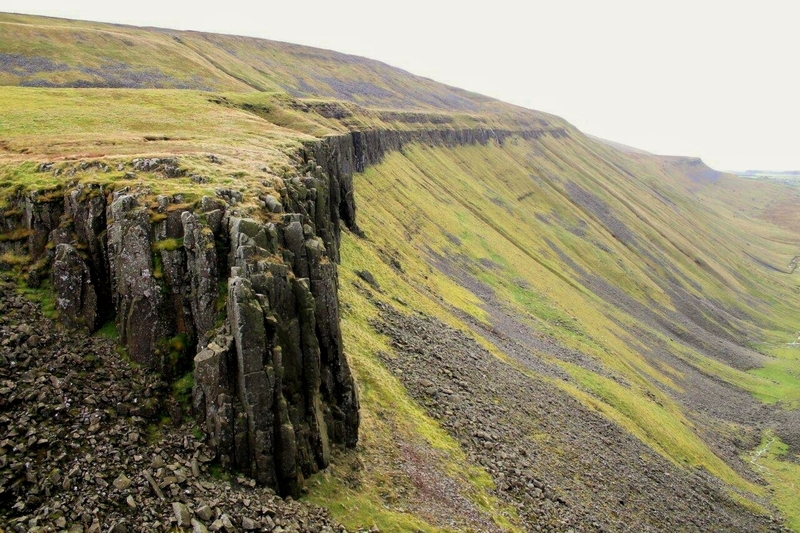 If you’re walking south to north, which I expect you are, you come to High Cup from the east – which is by far the best route to approach it because you don’t know it’s there until you are virtually standing on the rim. And it suddenly opens up beneath your feet. I shall keep an eye on your blog, as always, and I shall expect to see a Belfast sink in the corner of one of the pictures. Marvelous stuff. Mother in Law still has a Belfast sink and it’s the perfect place for a mucky terrier. Hi JonJo. Yet another example of the usefulness of a Belfast sink. Why were people so eager to throw them out? It’s reassuring to hear that some people still have them. I bet the terrier’s not as enthusiastic, mind. Great post! I love the rock formations. I have similar memories of a Belfast sink. And no, I don’t know what the little baby sinks are for, either! 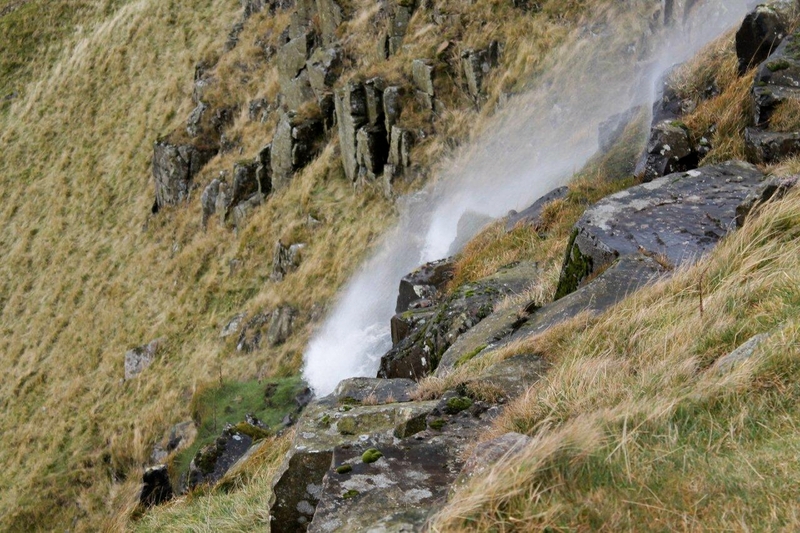 Amazing photos of the spray blowing back up the waterfall, and the sunlight raking across the moors. Hi Jo. A pattern is beginning to emerge here. People who have come into contact with Belfast sinks have fond memories of them; and no one is a hundred per cent sure of what the teeny sinks on modern units are actually used for. I shall have to do more research. There might be a book opportunity here. PS: The spray from the waterfalls. 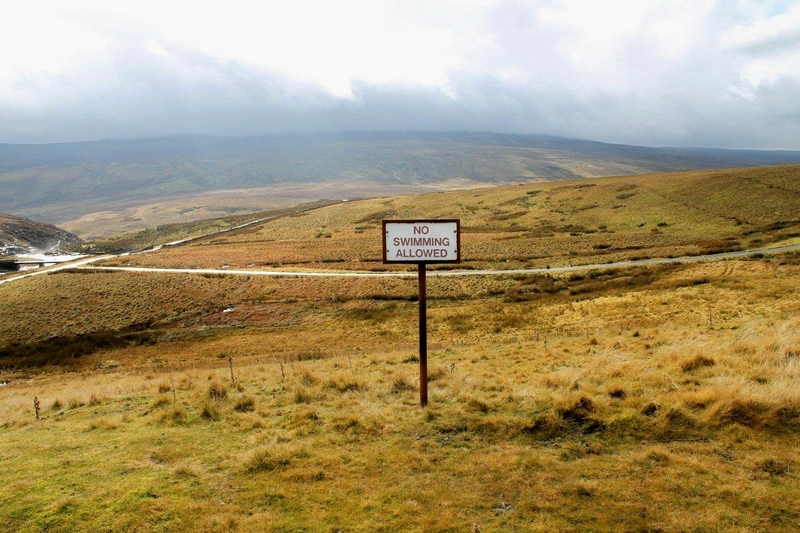 I’ve seen this happen a few times over the years, but only in the Pennines. Perhaps that’s just coincidence. Love the pics, it’s always a stunning lunch stop. I was travelling to Appleby and looking upto High Cup Nick today and was thinking it’s about time I went up there again and then I came across your post, brilliant. A before Christmas trek up is on the cards. Hi Mick. Thanks for that. I’ve been up there three times since I moved to the North-East from Cumbria in 1995, and the weather has been the same on each occasion – damp and cloudy. I would imagine High Cup is spectacular late in the year with a scattering of snow, or on one of those clear frosty mornings with a perfect blue sky. Might go back myself sometime soon. 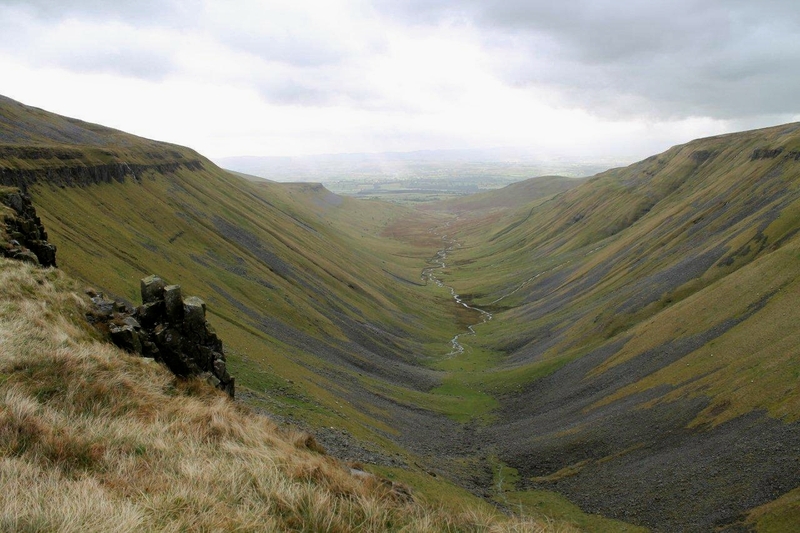 Great stuff Alen, I think High Cup is easier from Dufton. Well it is if you live in Cumbria. Greg, I would be surprised if they had piped water in Tebay, never mind Belfast sinks. You were probably lucky to have crisp packets. I did it from Dufton once, and I’m just looking at the map now to see which way I went. 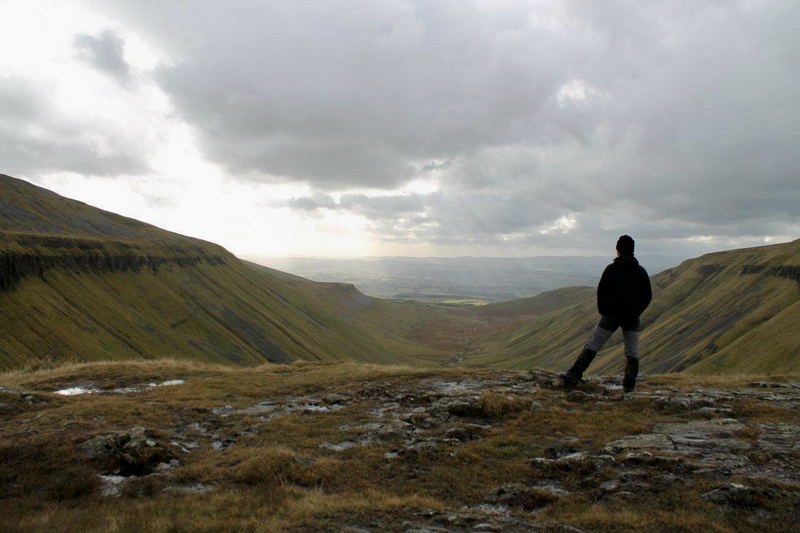 It was a long time ago but I think I climbed up Green Fell then doubled back along the ridge to High Cup. What I do recall very clearly Is having a pot of tea and a slice of cake outside a little teashop. Now that would be right up your street. Ah, the perils of drink, Alex. And do we ever learn? No. Which brings us to yet another use for Belfast sinks – garden planters. I once used one for growing lettuce in the backyard of a house in Dalton-in-Furness. Can’t remember what happened to it – I must have left it there when I moved. I’ve a good mind to go back and get it! Stunning photos and a hardy laugh. Just lightened an otherwise blue day Alan. The short article says the rock is Dolorite, some type of basalt If I remember correctly. Looks to be formed during a period of uplift, which would have that creek being there an incredible amount of time. No swimming! Hi Dohn. I looked into dolorite with a view to writing a couple of paragraphs on the geology. Apparently the term has slightly different meanings in Europe and North America, giving rise to “varying conflicting uses of diabase”, according to Wikipedia. But it’s all basalt, nonetheless. So I steered clear of the subject just to be on the safe side. Suffice to say there was huge uplift hundreds of millions of years ago, the whole thing got shot through with basalt dykes, then time, ice and other forces wore it away (that’s a safe enough description because it probably applies to most mountain ranges). And of course there’s no swimming. Not that you’d want to up there in November – or any time of the year, come to that! I enjoyed that Alen. Another good approach which you may, or may not, have done is up High Cup Gill. 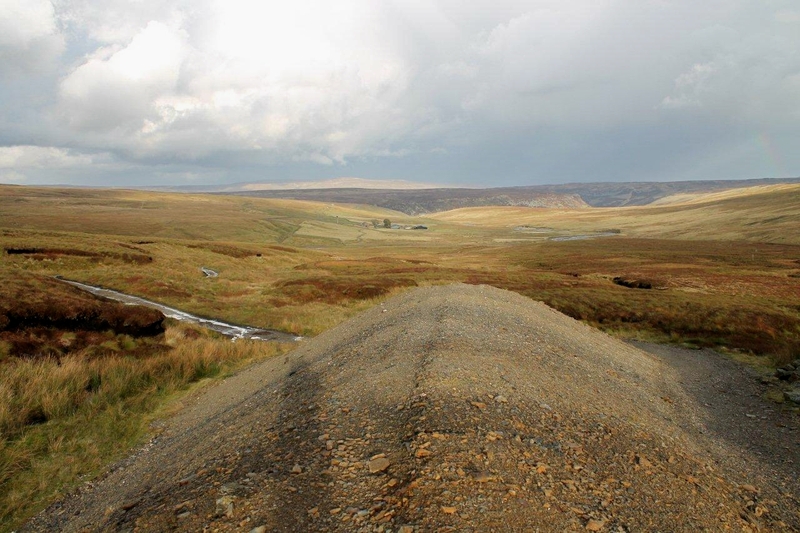 It does not give the immediate panorama of the Teesdale approach, but does provide an interesting perspective from below. As for the small sink – my ten bobs worth is the small sink is simply for washing your hands. If you have ever been in a commercial kitchen you will notice that there is usually a tiny sink on its own for washing hands. Washing hands in the washing up/food prep sink is not considered hygienic in commercial kitchens so assume it has come from that. Hi David. I remember going to the pictures to see that film. My mate and I laughed our heads off at the sink scene. We talked about it for weeks. Steptoe must rank as one of the greatest and most original sitcoms ever. I’ve been looking at Bing maps again and, yes, that route up the gill looks like it would be an interesting walk and certainly a new approach, perhaps doubling back over Murton Fell or heading the other way to Knock Fell. I’ll put it on the list. Your little sink theory sounds plausible – I think your ten bob’s pretty safe at the moment. What’s interesting is that no one seems to know for sure. I should really contact a sink manufacturer and get to the bottom of the issue. And finally, I love the thought of Belfast sinks surviving the human race. I was immediately reminded of that scene from Beneath the Planet of the Apes where Charlton Heston sees the Statue of Liberty sticking out of the sand and realises he’s on post-nuclear war Earth and not a distant planet. Nasa should send a Belfast sink into deep space instead of a Will.i.am CD. Weirdly, I don’t remember Belfast sinks…. Sorry. 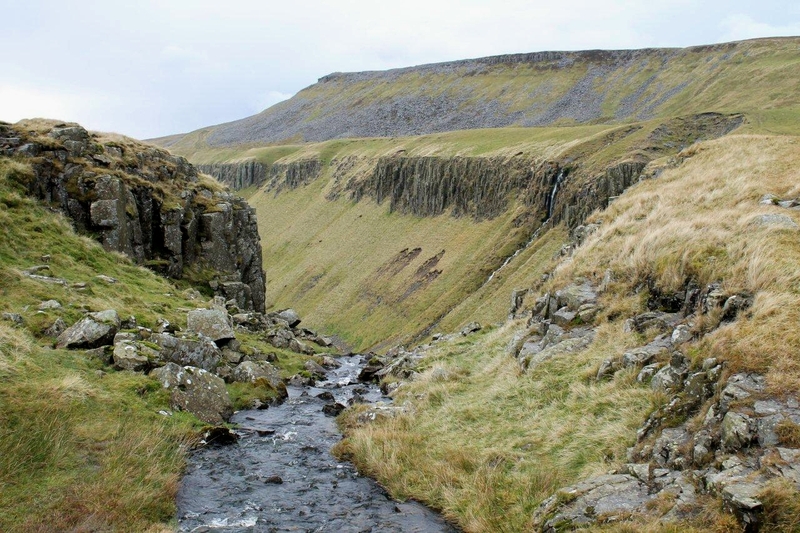 But I do remember visiting High Cup Nick. It’s brilliant. As is that waterfall. Class! Give over. Everyone remembers Belfast sinks, Tracey. They were part and parcel of growing up – like tin baths and chilblains. 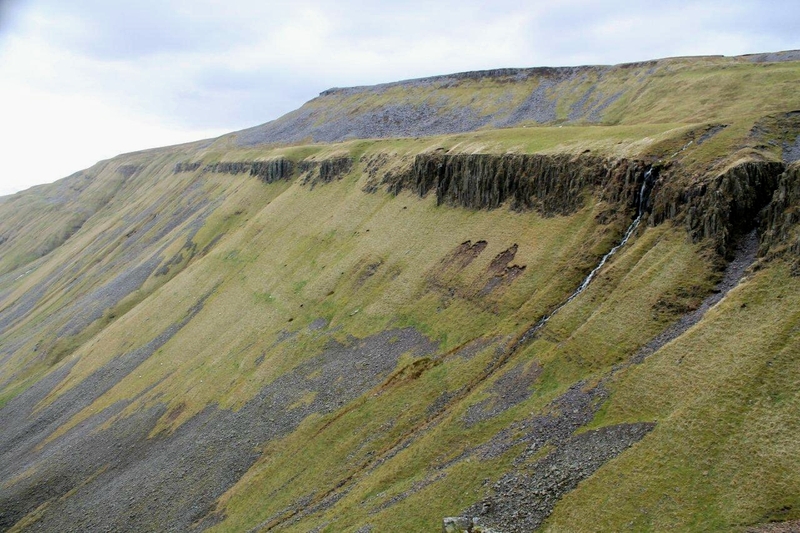 Yes, High Cup is one of the most spectacular places around here. It’s crossed my mind to camp for a night right near the top where the waterfall goes over. No reason, really, other than I just fancy doing it. It’s probably yet another of those things that I’ll never get round to. It is a lovely post you have written, Alen. I was amused by all the Belfast sinks utilities, not to mention the arm of rain. This weather forecast predicted a cold front. Are we talking octopuses when hurricane? Glorious history. Love the picture of your unruly granddaughter. Great nature, exciting place. Hej Hanna. Yes, arms of rain and cold fronts – we get a lot of them over here. Your pictures of Denmark and Norway look tropical in comparison, with all those blue skies. The unruly granddaughter is getting more unruly all the time. When she’s old enough I’ll take her walking to burn up some of her energy. She’ll probably tire me out though! I’ve never owned a Belfast Sink (or known what they’re called), nor been to High Cup. But I really enjoyed your post, Alen, and am a lot more knowledgeable than I was 10 minutes ago. Particularly about Belfast Sinks (I’ll be telling everyone about them now !). Thanks very much for that. Nice website you’ve got there, by the way. Not much room in a campervan for a Belfast sink, though. I’d forgotten all about being bathed by my Mum in the big white sink in the kitchen. Yes it would have been a Belfast. And my Dad had fitted an electric water heater to the wall above it. It was big and white with square corers and a long chrome pipe and took up a lot of space. It was much bigger than the cylindrical gas ones. Ascots, weren’t they? And I remember thinking it would be hot and I was worried about touching it accidentally, though I never did. I burnt my hand on the Aga flue pipe instead. I suppose I was 4. Hmmm. Thanks for that. More memories. Thanks for that, Tony. I remember the gas boiler my aunties had because the pilot light used to fascinate me. And there was a long pipe that you moved around to divert the water to where you wanted it. Great stuff. I think you took great shots of the place. Whatever happened to the manufacturer of Belfast sinks? Are they still around? Are they off the market now? Hi. The Belfast sink is still in production and can be obtained from a number of manufacturers. I should be on a commission. Hi, as a plumber and mountaineer I enjoyed reading your article. 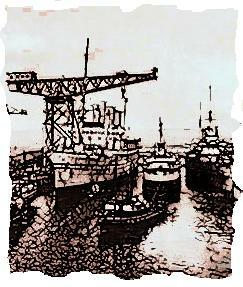 I spent the late 40s & 50s installing Belfast sinks, and the 60s ripping them out. Downside, unforgiving to crockery, no plastic bowls then, also used to much of the limited hot water reserves, remember hot water came from a fireplace backboiler. The joint between the wooden drainer board and the sink became a hidden damp filthy world for the likes of silver fish and other crawlies. Upside, you could wash all kinds of things from pots to welly boots, soak clothes, bathe children, tough, did not scratch. In fact I have recently installed one to fulfil all of these and more uses, to many to list, but not in the kitchen but a utility room. Hi Colin. Now that’s what I call an expert opinion. I can see there may have been design problems, such as the drain on resources and the harbouring of wildlife (mind you, there were creepy crawlies, mice and other things lurking in all kitchen nooks and crannies in those days) but I’m more than happy with mine. By the way, are you still doing plumbing jobs between hills because I need a radiator fitting in the living room? Helvellyn!!! Alen, I would, but sadly I came to a Great End on the High st. A Great Carrs hit this Coniston Old Man and with High Stile I Harter Fell off my Honda 90cc. The Sergeant Man has booked the Birks. My broken leg is resting on a Pillar in a High Raise position. So always look on the Whiteside of life. I don’t know Wetherlam or not to compete with this. Hope you didn’t Skiddaw too far when you Mell Fell off your Honda 90cc, Colin. Wouldn’t want you to end up with a Broad End. I remember the tin baths well – we used to bath in front of the fire in the ‘lounge’ (aka the front room) and it was much nicer than the modern-day cold bathrooms. I also remember we had 2 of those sinks (although didn’t know they were ‘Belfast’ ones) – one in the scullery and one in the kitchen. I think those little oval sinklets are for using when someone else has a bowl of washing up in the main sink – possibly for washing your water bottle when you come back in after a walk! Can’t agree with you on the uPVC doors and windows though – that’s about the only thing which has finally warmed my leaky 70s house up a bit – that and the loft insulation. I had the walls and underfloor insulated and it didn’t make any difference at all! 😦 And at least they’re harder to break into if someone’s trying to burgle you. They also make things a lot quieter which is very important if you live on my street! You can probably swim and launch a super-tanker up there at the moment. The bottom half of my allotment has been under water for weeks and shows little sign of drying up. The leeks don’t seem to be taking any harm though. We used to call the front room the “parlour”, and it was only used on special occasions. But you’ve jogged my memory there, because we also had a little room joined onto the kitchen that was called the scullery (which is where the Belfast sink was) – but I’d forgotten calling it that. Happy days. My wooden windows rattle like hell and two of them need replacing. Can’t beat traditional materials, that’s what I say. The parlour – that sounds quite posh! We were very posh. We had a forecourt garden and an inside toilet. Ahhh. Here it is…..smashing. This is the sort of story that leaves me in a different place than I expected to be. I came for the cup and left with the sink. I’ve not actually been to the cup yet. We made an attempt a year or so ago from Dufton. By the time we got to Great Runsdale Tarn it was clouding over….but we pressed on, following the beck. The novelty of bog-trotting was wearing off with the family and the last straw was assault by frog. Every time we hauled ourselves out of an ill-conceived, trench-foot-inducing path/pit we found ourselves confronted by the things. The final last straw was when the beck wasn’t how it should be on the map, because another beck had appeared after heavy rain. My family took this as crass mis-navigation on my part and committed mutiny. We were yards from the pennine way and the bridge leading to the cup. We trotted dully back to the tarn. At which point an unforeseeable blanket of inpenetrable mist (4-5ft visibility – no more) appeared quickly, and from no-where, and spilled over the sides of the ‘cut’ leading downhill. Rather like dry ice in a Meatloaf video. This provided, if it were needed, complete vindication of the cowardly acts of family members. I’ll go again. Maybe taking the dryer route from the village. Your pictures and story once again nudge me out of the armchair. Hi Steve. Your family day out reads like a script for a Mike Leigh television play. My wife would have mutinied at the first croak of a frog. She suffers from frog-aphobia. There’s probably a proper name for it because there always is. It’s a shame the weather turned bad. So near, but yet so far. I’ve never been up there from the Dufton side, but it’s a shorter walk and so probably worth trying. 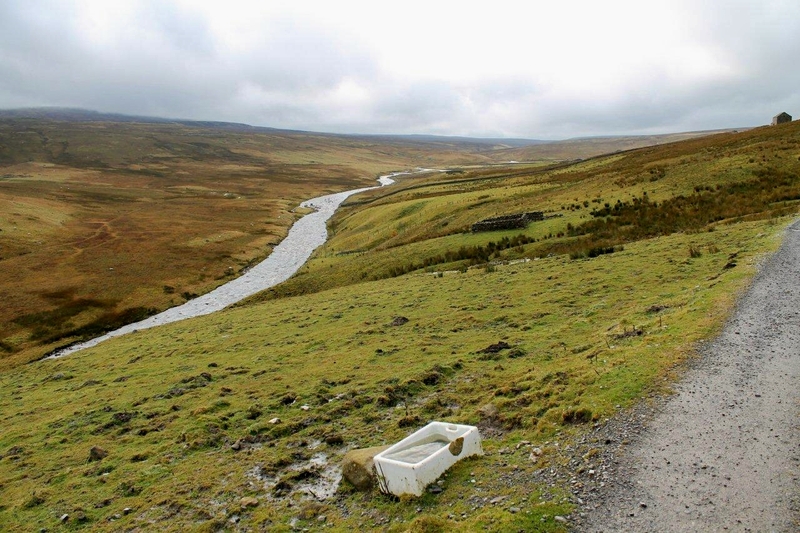 It’s a slog from Cow Green reservoir, but the added bonus is that you don’t see the cup until you’re actually standing on the rim. And suddenly it’s there in all its glory. Fantastic.